The violin bridge is held in place by pressure and proper placement, not glue (tension from the violin strings holds it in place). 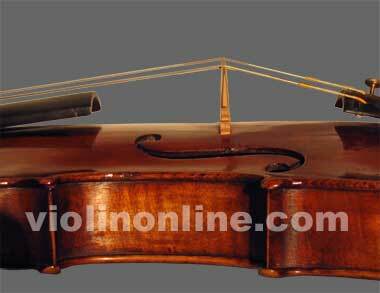 The bridge is evenly lined up with the fingerboard, and stands straight up, perpendicular to the violin. The feet of the bridge should be aligned with the interior notches of the F-holes. The lower side of the bridge should be placed under the E string (the string with the highest pitch). When adjusting or putting a bridge on the violin, it's very important to slightly loosen the violin strings before the bridge is placed, centered, and kept perfectly straight (perpendicular to the violin). To adjust a tilting bridge, first slightly loosen the violin strings, then grasp the top of the bridge at its upper corners with the thumb and index fingers of each hand and gently pull or push the top of the bridge until a 90° angle is achieved. When violin strings are tightened, the top of the bridge sometimes tilts slightly forward. if this happens, adjust the bridge as needed to make sure the bridge remains perpendicular to the top of the violin and the bridge feet are flush against the violin. If your bridge has become warped (or you feel uncomfortable adjusting it), take your violin to your local violin shop or instrument dealer for professional assistance.